Ironically it seems true. Everyone is claiming to be the winner, but in reality nobody gained anything from this. 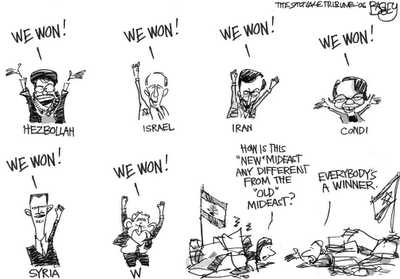 Well, Israel did not say they won (not that I recall), although BUSH said it indirectly in one of his speeches on his "war on terror" BS something or other, which was so laughable it was disgusting. That’s what i was referring to doc. It’s ridiculous, countries have been destroyed and their claiming victory. Well at least we didn't lose anything. Okay some money yes, I had to pay more for gas. Yes lebanon did loose many civilians and land was damanged...but nothing was accomplished. Look at the picture in the article..."I see that Lebanon is nor represented in the caricatures..."
Um the guy under the flag with a Cypress tree Peach is a Leb representaion. I don't see a Jew either if I use your view point. Why not complain about that? Its a cedar tree, Sam. Do not mix that up, ever. Sorry my bad, I guess you guys care about some truth. Your just blind to the stuff that really matters. Sam is so amusing, its almost sad. Doc - I don't intend to spend anymore time on the fool. But, here are some quotes from when he had his renaissance a week ago. Seems he was experimenting with the idea of making everybody hate him and then come out as a "good guy" who was concerned with peace and love. Looks like we're back to showing the true colors - instead of hiding behind BS. I'd say he ought to be blocked but he's a constant reminder there are complete fools who can type so there are some also who can push buttons. About half way down you'll see Lola seeming to take him seriously and Sam lying directly to her - he's scum. Ignore him. I know it sounds bi-polar but I was trying to build as much hate as possible. If anyone person could then listen to a single word I said..... well I'm sure you get the point. So Kevin is offering up some idea's, sho's next. what can we offer to the leaders of these countries as idea's. Can any of the idea's we start to generate be placed ina special blog that is saved? I'm asking this of the authors of this blog? Kevin, just stay foucused as will I. I'm not into batteling nor explaing my past. Lets keep this ball rolling, more people will join in and it can help. Come on guys, what do we have to lose? You're voice will be heard as will mine. We can make a change but it takes more than two people. It's a great start but join us. I will be writing you Kevin, thanks for being open minded. It's a shame to loose you here, there is good but it's hidden in the consatant hate and finger pointing. Like I am doing right now. But I won't give up, I'm staying here even if some people say stuff or use my name. It's cool becasue my mum and da taught me before 1st grade that people will always try to hurt you with words. Alwasy remember Sam that they're words not actions. Why is Sam so focussed now on changing things in the Middle East? I don't get it. You've been bashing Lebanese, Muslims, Christians, Jews, the list goes on, for the past few weeks. Why do you care all of a sudden? I am really curious. Or is it an act? Or is someone else using your name? I don't know what it is, but something is wrong. You are sounding to descent for once. I don't like it. Sam, the sad thing is, maybe you do really care. But i am sure you've heard the story of the boy who cried wolf. Nobody cared at the end. I don't know what to believe. Kevin, what do you want to do? What is your plan? What do you need? It has so little to do with the middle east. It has to do with much more. China, North Korea, Russia, Pakistan, Afganistan.. all of the stans for that matter. The first step is the middle east, it will spread once started. I cared before but after reading the post for a few days and seeing the views I tried something different. You tell me, how many people would be so hateful to all people religons and such? I wanted to make an example of myself. And everyone can tell it's me, whoi else type's as bad? People use my name for insults but thats okay. Their just words. So then stop the insults and help build faith and love..... which leads to peace. I do have some education and training in psychology--I would classify him with a personality disorder. Definately not bi-polar, because he is lying when he's somewhat nice. Enough about him. I am done. Guys, please - let's avoid diverting the conversation to totally unrelated places again, like the Sam Issue... this is possibly how the blog deteriorated in the first place and how we got the anonymous comment option blocked. If you don't care about him just ignore him, and let's stick to the important issues at hand! that's what we're here for, not to talk about Sam. lilu is correct of course, a tiny percentage of non-Arabic Israeli's didn't support the war in Lebanon. Also lilu is correct about the comments continuing to be being used by certain posters to spread insidious US right-wing propaganda that only a child or illiterate would believe. At least you can correct a child. Yes, and it seems that, from the dusty shores of Salt Lake, the White House and the State Dept. are about as close to each other as Iran and Israel..
Syria is right saying that deployment of UN forces on the northern border would be unjustified. the attitude of the total deployment would suggest that Lebanon is surrounded by "enemies". do Lebanese people find fair to be treated as they would get sickening by the neighbour countries? on the other hand the attitude of the total deplyment would suggest that Lebanon is the trouble maker, thus Izrael wining the "game" of nasty war (white-anglosaxon-reach) practically on all fronts. others may think if Syria refuses deployment on the northern border that the refusal might be cause by feeling "guilty" of interfering into inner affairs of lebanon. after accepted most of refugees it is rather more than unfair that Syria would be mistrusted. Lebanon must care not to become paranoied. you will see who interferes and why, but somebody aleady suggested wise what might have been the actual cause of Hariri's murder. war on terror is a long strategy, but we, people, who have suffered of other historical wars are not only tired of manipulations, but also see inbehind of the "urtains" ... you may say walls or whatever .. Sharon was not gratified by "god" building the concrete wall, which resembles Berlin wall. are the moives to create another Cold war? STUPID! AMERICANS NEVER LEARN and see aliens where they don't exist. by the way, the A-bomb wabuilt by scientists who escaped Nazis in Germany. I would hope that the musli, who feel mistreated by their governements mind well who has rewarded them! IF YOU ONLY KNEW WHO LOST! IN LEBANON THERE ARE WORSE MILITIAS OR FACTIONS THAT HAVE NOT REARED THEIR UGLY HEADS TO SHOW WHAT FANATICISM REALLY IS! IF U GO CLOSE TO THE BEIRUT STADIUM ON THE HIGHWAY THAT CONNECTS BEIRUT TO THE AIRPORT ...THE SOUTH OR THE OTHER WAY TO DOWNTOWN BEIRUT THAT HARIRI BUILT U SEE ADS THAT SAY "THE DIVINE VICTROY" HAH ! I AM SHII'TE I LIVE IN BEIRUT AND ALL I CAN SAY IS THAT THIS IS A FARCE OF A PLAY THAT TURNS MY STOMACH! My comments could sound negative, but it is true what is really happened right now. Most media biased, reporters hid the actual things happened and exaggerated. Power crazy, arrogant, greedy, hatred, biased toward particular community and religion exercised by incompetent leaders that contributed to the killing of innocents, women and children. I was shocked when Bush and neo-cons declared openly that Israel won the battle without even considering the lives of innocents involved. The war was in fact a set up or orchestrated by Bush neo-cons and Olmert. The war started according to media after Hez abducted 2 IDF soldiers. So next time, my country could also follow the same of what Israel did if any of our citizen abducted by any country. Sound ridiculous isn’t it? Leaders were behaving like a child. There shall be no solution to the problem when people keep pointing fingers at others and the resolution favour one side only. The crisis in Middle East will continue until end of the world if the people do not elect a capable leader. The message is loud and clear. I truly wanted to do more an dsupport but the lashing here never stopped in any direction and Howard was the worst. How fitting he pulls text and tries to continue the hate. Doing a job Howard. It's okay duckie, keep slamming me. And I thought last night that the wood of both tree's burn just as well. Use those to fire up your new anti jew ovens. It's what you people really want. The death of the Jews but your affraid to say it out loud. I hope the Israeli State stays the course. It's the only way, the Lebs and radical Mulsims are and will never truly seek peace until they get on it on the ashes of their enemies. yes, that's really sad that leaders behave like children not minding the youth at all. it is so, because only rich people who enough money maniuplating the mass media buy people to become chosen. susu, i am sorry and i am aware that facts are ugly an to believe Allah and remember all those who sacrified thelseves for a true one, seem to be just pulled through sand and ashes. believe me, what ever have written, i learnt from my own expirience striving reasonable and together with those i love and respect to would survive in peace. every time i mind, the only matter which gives me strength is Sura Al-Baqara, 1-5. for the purpose of my belief i don't read Qur'an in english. to those and every leader: only a weapon wins! what remains betwen us and the craetor is reasoning. these they forget, or don't know, never learnt, because they must mind to succee not the truth. I THINK SAM THAT U R A ZIONIST NOT A JEW BCS THEY R TWO DIFFERENT THINGS! U R AN EXTREME LIKE HZ! hm, sorry for the spelling ?!? and eaten words ..? sam, you need a tranquillizer or a glass of warm milk. ask your neighbour Jew (?! what a joke is this word, in fact not existing one, but invented by the westerns - how great!) if he approves drinking milk? or honey or water or wine .. i waonder who spills lies about the truth of Qur'an??? I'm not a Zionist, the lebs are supported by everyone good and bad. The USA is sending millions of dollars to Leb to help. So is Iran and other radicla parties. HZ has offered to help rebuild, duh it's their country too. Who is helping the State of Israel besides the US, Britian and a few others? Is Iran or HZ? So when everyone gets off their high horse and realizes that the deck is stacked against Israel peace may come. Until then they need some people shouting too. I am neither a Jew or Zionist. their people have been inslaved, persicuted and killed for thousands of years. They deserve a break. I'm an exremeist against wack jobs like you people who are so against the Jews. The diff between an American extremist and a radical Muslim is I'm not going to kill anyone nor harm a soul. Lies about the Koran? We don't have to spread anythihng. The radical mulsims are spreading the truth that is within the koran. Where is at least one terrorist with an AK-47 or RPG when we need him? Oh come HCB, more violence huh. Your true colors keep seeping out, thats right your all for Iran and thier ways. Kill those who don't agree. Did your fight on behalf of the VC in nam? I noticed your selction of weapons was from your enemy??? Oh wait your companions. If you were a real patriot you would have suggested a AR-15/ M-16 or a Gernade launcer not a VC weapon. You're a true traitor to the core. it is so poor to narrate events nationalistic .. yes, to rely that muslims spread lies themselves is simple since children are not even physically capable to would go to school by a narrow path, must work due to lack of goods, are kidnapped by whoever kidnapps .. and i am rather sure that you know very little of the history of Asia and MEast before the year 1970 .. it is very USFUL to LOOK at THE FACTS in THE PRESENT since they are really simple. mr. Bush/Bush and before these two all those brilliant AS (anglo-saxon) leaders of the 20th century .. oh, did anybody see on tv Richard Gere waltzing with the liberal prime minister of japan, the yupi one?? can you imagine that USA buddists supported invasin of Iraq by NATO? unbelievable .. those wellknown pacifists complaing about China C-O-N-S-T-A-N-T-L-Y!! !